Matthews-Blackwell, in 1919, had 6 meat-packing plants in Canada, including Montreal and was the largest packing business in the country. The image below, (Taken from “The Maritime Merchant” dated February 20, 1919 page 63, as found on Google News Archive.) 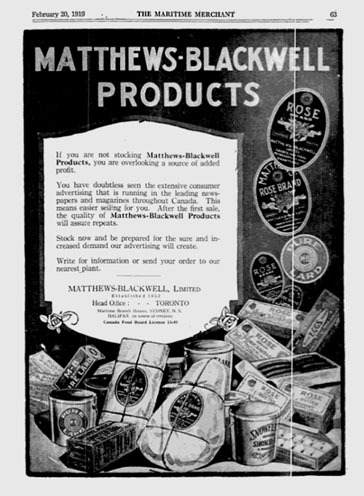 shows the variety of products which were produced and sold by Matthews-Blackwell, including hams, bacon, pork, beef, sausages, lard, shortening, butter and eggs sold under the Rose and Anchor brand names. Another ad can be found in the Montreal Post, 1914, here. In Montreal’s Lovell’s directory 1918-1919, the company had 5 retail shops, 1 wholesale outlet and on Mill Street, an office and packing house. Interestingly, their listing for Matthews-Blackwell in 1919-1920 changed to the office and packing house plus 3 wholesale outlets and no retail shops. At the time Canada's Aid to the Allies and Peace Memorial was published in 1919, more than 200 employees of Matthews-Blackwell were honored in the following roll of those who enlisted for service in World War 1.